There is tuna in tuna noodle casserole. There are strawberries in strawberry shortcake. There’s ice cream in an ice cream soda. But there’s no egg in an egg cream—and there’s no cream, either. The ingredients are milk, seltzer and chocolate syrup. In other words, it’s a carbonated chocolate soda made creamy with milk, or carbonated chocolate milk. There are riffs on the original chocolate drink, a long-ago staple of New York City soda fountains. So let’s make a strawberry egg cream. Strawberry egg cream. Photo courtesy Polar Seltzer. 1. ADD a generous dollop of strawberry preserves or strawberry syrup to the bottom of a glass. 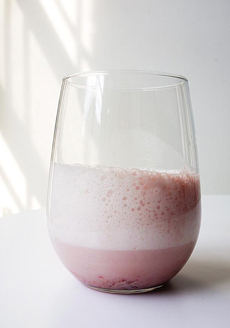 If using fresh or frozen strawberries, muddle in the bottom of the glass and sweeten to taste (an opportunity to add a non-caloric or low-glycemic sweetener). 2. ADD 1/4 cup cold milk, and whisk together. 3. TOP off with vanilla seltzer, strawberry seltzer or plain seltzer. Be sure not to over-dilute the strawberry-milk mix. For a richer drink, use half and half. And try other fruit variations. Blueberry egg cream, anyone? Here’s the history of the egg cream and recipe for the classic chocolate egg cream.